When I first found this recipe, I knew I had to try it. I am very particular about salsas, because I don't like tomato chunks! 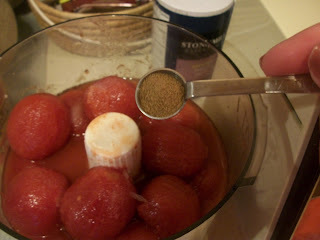 As you've seen in previous recipes on this site, if a recipe calls for a can of diced tomatoes, I puree it first! So I knew that this recipe was perfect for me. So I made it. This recipe makes A LOT so I brought it to a party where there were a lot of people. And I've lost count of how many people asked me how to make it! It was a huge hit. And no wonder. It's absolutely delicious. Bright tomato flavor (with no chunks!) with just the right amount of cilantro and the perfect degree of heat. We served this with chips in the first round and the small bit of leftover salsa was enjoyed on top of taco salad. Do you have a summer gathering coming up? 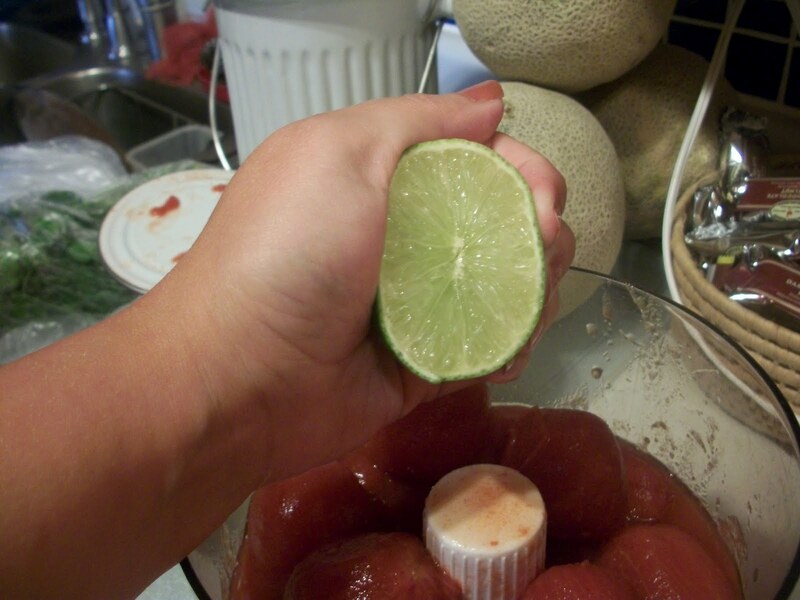 Make this salsa! If not, still make it. And hoard it for yourself. Add the Rotel, then process until no chunks remain! 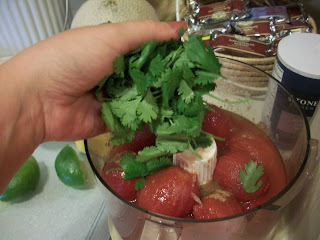 Refrigerate the salsa for an hour or so before serving to let the flavors "cook." Enjoy with chips, and all your favorite Mexican foods. Find lots of other great ideas at Hearth and Soul, Cast Party Wednesday, What's Cooking Wednesday, Whole Foods Wednesday, Whatcha Whipped Up Wednesday, Full Plate Thursday, Swanky Stuff, Pennywise Platter, Recipe Box, Thursday's Treasures, Tastetastic Thursday, It's a Keeper, Foodie Friday, Food on Fridays, Friday Food, Foodtastic Friday, Foodie Friday (#2). 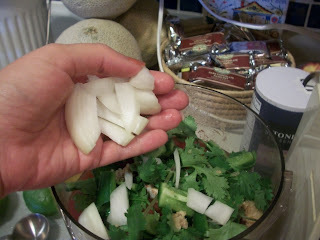 Add all ingredients to a food processor. Pulse until you get desired consistency. Refrigerate for at least one hour, and then serve with your favorite tortilla chips. 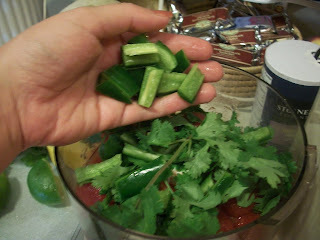 I LOOOOOOVE fresh salsa. Isn't it SO much better than the store bought kind? I'm with you too on the no tomato chunks thing. I like it nice and smooth. Haha I'm seriously going to try this. It looks and sounds delicious! New follower here. Yay for being blog friends! 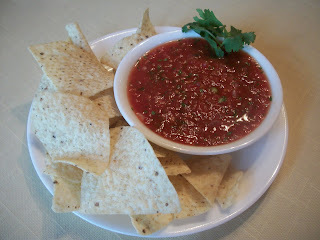 I love how velvety smooth your salsa is... beautiful. Thanks for sharing it on foodie friday. We do love salsa--this looks like a yummy recipe. 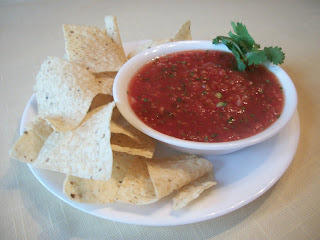 I can never get enough of salsa- that looks terrific! Try dipping pretzels into it- thats my favorite way to eat salsa.